Our next visit was to the Vernon – Leon H. Washington Jr. Memorial Library. Every library is a whole new world of delight for Riley. She looks at everyone we walk past, and it seems everyone looks back at her with a smile. The magic of babies and books. The library card I use is always on my key ring. It is a smaller version of the one above, a limited design by Shepard Fairey and Cleon Peterson that came out last year — a few months after my daughter was born. I remember one of my first outings alone post baby was to make sure I got one of these cards! I’m a nerd. Anyway, the Vernon library was very welcoming. The librarian scanned our books in, and pointed us in the direction of the children’s section. There was a lovely lady nursing her baby and helping her other daughter with homework at one of the small tables. Riley instantly wanted to go crawl over to the baby for a visit. One of the first books I pulled off the shelf at random, was Ron’s Big Mission by Rose Blue and Corinne J. Naden. What luck to find a book about a library. . . and also racial segregation and inspiration to become an astronaut (the book is based on astronaut Dr. Ron McNair). I had been thinking about the location of the Vernon Branch as we drove here, through the intersection of South Central Avenue and Martin Luther King Jr. Boulevard. Twenty-five years ago, this week, I was fourteen years old when the L.A. riots took place right around this library. And then a few years ago in 2012, the space shuttle Endeavour made its way through the L.A. streets. After reading through Ron’s Big Mission — and holding my library card even more dear to my heart, I happened upon Yum! Yuck! by Linda Sue Park and Julia Durango. It’s a very sweet foldout book of the sounds people make in different languages, such as Wow! in English or Voy! in Farsi. We then found a board book called The Game of Shapes by Herve Tullet, which Riley likes to put her fingers through. A little scientist in the making, exploring every inch of books and the wonders inside. The last book we got in the Children’s section was Oh No, George! by Chris Haughton because it happened to be sticking out from the shelf. It made me laugh. George is a dog who is trying to be good. . . Some of LAPL branch libraries have L.A. Plays kits. It’s a great resource for parents and kids. Here’s a video that interviews Panorama City Branch librarian Beth Gallego (who I met on Twitter last week!) and will meet in person when I visit branch 39! You can check out a kit for a week, and must return it to the same branch. As a speech language pathologist (my day job) I love how toys and books are put together in these kits – involvement in an enjoyable activity is so important for language and speech development. As we were saying goodbye and thank you to the Vernon Branch, we walked past some poetry . . . and I was reminded of how we sing poems every day to each other in the form of nursery rhymes. 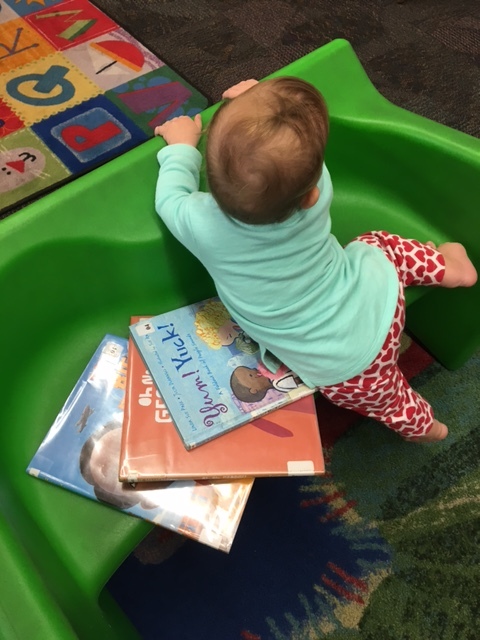 Riley reminds me that we all start very small, and because of places like the library we can dream really big and reach for the stars. If you’re a student, visit the Student Zone – available from 2:30-5:30p.m. Monday through Thursday to assist with homework and printing for school age children and teens through 12th grade! Thank you, Los Angeles Public Libraries. I guess I’m left with one question. How old do you have to be to get your first library card? Riley wants to know. We missed L.A.’s Festival of Books this past weekend due to being sick and couldn’t ask at the library booth. . .
No minimum age rage to get a library card, you just have to be born. 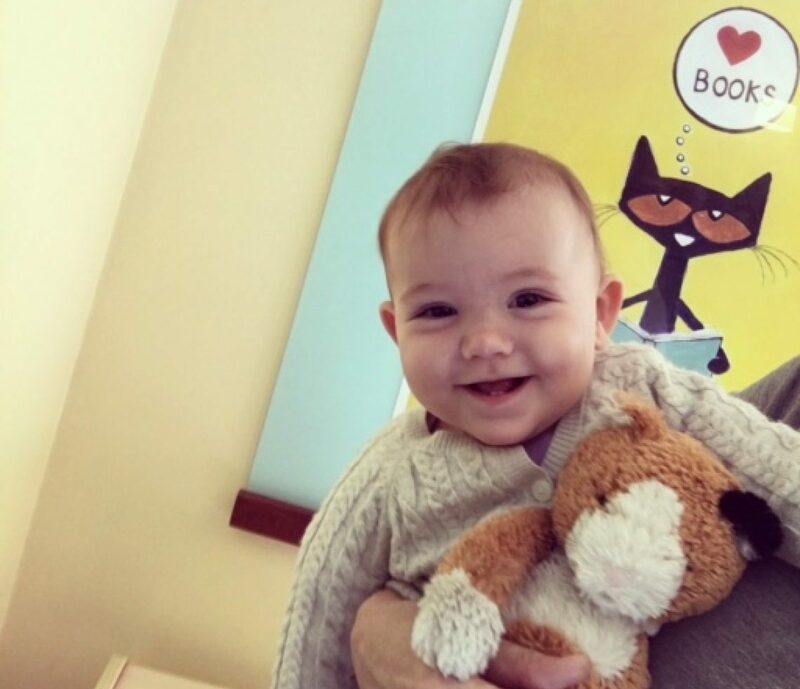 I hope that means Riley will be getting her first library card at the next branch! Thank you! I got her a card!